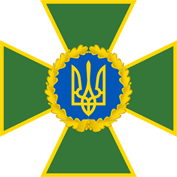 The Emblem of State Border Guard Service of Ukraine is a straight equilateral cross with divergent green tails and edging of yellow metal. In the middle of the Emblem there is an image of the golden colour Symbol of Volodymyr the Great’s Princely State on blue ground framed with wreath of yellow metal oak leaves. 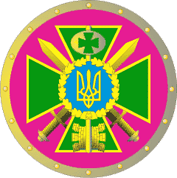 The Coat of the Administration of State Border Guard Service of Ukraine is a magenta round shield with golden edge ironing, against the background of which there is the heraldic sign of the Administration of State Border Guard Service of Ukraine – the Emblem of State Border Guard Service of Ukraine with the image of a key and two crossed swords with their edges upwards. The key hole is in the form of equilateral cross with divergent beams, and the key bit – 2 symmetrical walls. The images of the key and the swords are golden. 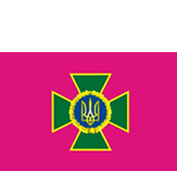 The Flag of State Border Guard Service of Ukraine is rectangular magenta cloth with aspect ratio 3:2. In the middle of the bunting there is the image of the Emblem of State Border Guard Service of Ukraine. Both sides of bunting are identical. 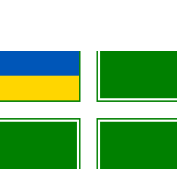 The Flag of Maritime Guard of State Border Guard Service of Ukraine is rectangular green bunting with straight white cross in the middle. The cross has green and white rims on three sides, and green rim on the side of canton. The width of each rim is 1/8 of the width height of bunting, and the width of rims is 1/5 of height of the bunting. The State Flag of Ukraine is placed in canton. The aspect ratio of bunting is 3:2. Both sides of the bunting are identical. 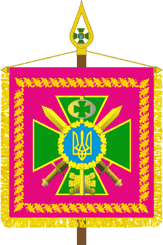 The Standard of the Head of State Border Guard Service of Ukraine (hereinafter – the Standard) is a magenta square bunting with image of the heraldic sign of the Administration of State Border Guard Service of Ukraine in the middle. The bunting is edged along the perimeter by golden lining in the form of ornament of oak and viburnum leaves. Free sides of the standard are decorated with golden fringe.